I'm Thom from Benicia, CA (suburb of San Francisco). I use my C600 mostly around town to pick up stuff from local supermarkets. Had it 4 years now and 6K miles. I've been riding since I was 18. First bike was a Honda Dream 305 that weighs about as much as the BMW scoot due to the cast iron fenders of the '63 bikes. Then got a basket case Bridgestone 350 2 stroke (still fastest bike I've ever ridden off the line). Another Honda 350 I rode around Hawaii on. Then a Harley (AMF vintage). Long hiatus without power bike (married and wife doesn't ride). Now retired and had a Chinese scoot which was a clone of a Honda scoot. Liked the scoot idea (step through, lots of storage for errands, no gears) but the Chinabike was too light for the winds over the local bridge. So I sold it and got this bike for the looks and weight. Can't do long rides much anymore since neck issues cause pain after a couple hours in the saddle (and still have wife who doesn't ride). Great machine ... you are going to love it! Hi, I'm Frank from Denver, CO just got a new to me 2014 C650GT from an Indian Dealer in Garland TX, it has 6190 miles on it now since I rode it home from there. Plan on making a couple mods, adding a Givi V46 monokey top case, and some Denali LED running lights. Welcome to the forum. I have a 2014 with about 16,000 miles on it and have been happy so far. If you are getting a Givi case definitely go with the Givi rear carrier and not the BMW rack. The BMW has lots of plastic and needs some modifications or creativity to mount anything but the BMW top case. Lots of good info here, sometimes you need to dig around a bit but lots of info has been covered on many topics of mods, maintenance and general info. My last entry and my last BMW - ever! Been riding Bikes all my life- Harley: FLH Electra Glides , Triumphs: Bonneville 750, Trident, Tiger, BSA, Honda: CB350, 2006 Reflex, and now my first BMW: new 2016 C650GT Frozen Bronze Metallic. 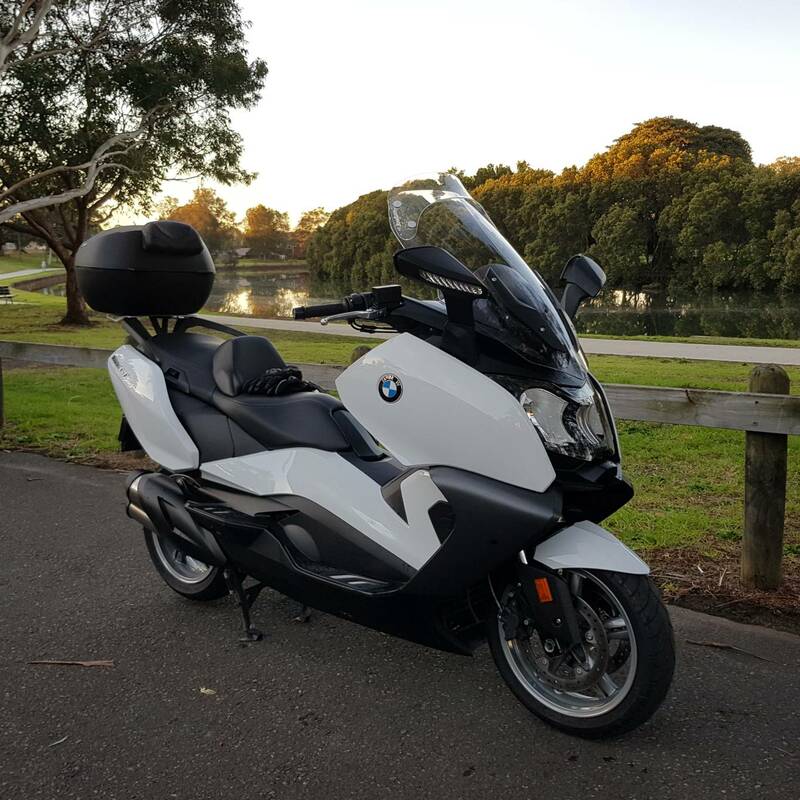 Just got her yesterday, rode nearly 300 miles on it and am looking for some other BMW C650GT Maxi-Scooter owners to give and get value added knowledge info on this scooter. Have already installed the KAOKO throttle, wind deflectors, BMW small top box with all accessories, AeroFlow C650GT Aeroscreen to replace the factory because of minimal wind control when all the way up, PIAA H7 Xtreme White Plus Bulb Kit, BMW C650GT All Weather Motorcycle Cover, Rear 16 LED Hyperlite running/brake modulator, Fuse block mounted in seat compartment (Centech AP-2). Waiting to locate the CORRECT MotorcycleLarry.com brake fluid reservoir cover Ball Mount part number to fit this BMW-I think it is the 9000 Burgman 650 cover but no one can tell me what the correct part is for this. I also am in touch with KRISS (very nice guy!) working on testing out the correct configuration for this 2016 C650GT can-bus Headlight (high beam) modulator. I have used KRISS modulators for many bikes and they are all still functioning like from day one. My Reflex for 9 years everyday! I trust their work. Anyone else know the Ball Mount Motorcyclelarry reservoir cover part # for this 2016 C650GT? Thanks and Ride Safe. My 2016 BMW C650GT Frozen Bronze with top case, back rest and many other accessories departed me to a new owner Saturday because this scooter was just not meant for two riders comfortably. Height was way to high, labor was intensive to do any work on and it was VERY expensive to maintain-especially if dealer does any work. It was not what I originally expected from a BMW and will never buy any BMW again. Am now a new PROUD 2018 Can-AM RT limited Blue chrome owner and need to say goodbye to all you C650GT owners and wish you the best. My dealer said there is no demand for these and had no interest in selling anymore of these because of the shop time to perform any maintenance. Also, I would like to ad that the Hyper lights purchased for this scooter were nothing but double sided JUNK that wouldn't stay glued to anything. (That feels better getting that Hyperlight frustrating junk off my chest-why would you double side tape anything to a hard pounding Wisconsin pothole road?) My last words are "keep em between the ditches and enjoy the journey". Hello, I live in northern Virginia, 45 min west of Washington DC. Bought my c650gt in Feb and am loving it! Since re-entering the motorcycle world I've had VespaET4 (still have that), Ducati 999 (cooler than me and I REALLY learned to love and trust Michelin tires!) Piaggio mp3 (dealers kept closing!) Honda cbr300 ( all the fun of a sport bike none of the felony speeds! That was the plan anyway, just not good at long or short trips) and now this BMW is the sweet spot which I can't ride enough! 20 plus years as an air traffic controller and hope to put some miles on this ride when I retire soon. Happy trails to everyone! Greetings: I'm a life-long motorcyclist who switched to Can-Am Spyders three years ago following an ankle replacement. Ankle has healed and I'm back on two wheels, but with a reduced ability to hold up a big, top-heavy fully-loaded adventure bike with the lady on the back. Accordingly, I'm scaling back my ambitions and looking for a scoot that fits us both. Finding the Burgman 650 too wide in the seat for her shortlegs to reach the foot boards comfortably, I have test ridden a 2013 (Series 1?) C650GT at the Atlanta dealer. Other than sounding a little busy, mechanically, in the cockpit under hard acceleration,it was pleasant enough, so now I'm working on morphing my 2013 Can-Am Spyder ST SE5 into a scooter,instead. Got my eye on a peach of a deal on a 2016 that's out of state, and I'm quite open to talking trades for my Spyder and a suitable scooter with anyone on this forum who's ready for whatever reason (and there are plenty of good ones) to switch to a reverse trike. Hello all, I have just transferred over from the G+ group that is being deleted. This was the suggested destination for us refugees! Attached is a picture of the lovely Gertrude, she is a big fat lass. Hi, I'm pretty new. Can anyone tell me when should I change the chain of my 2014 C650GT with 18,000 miles? My manual says 40,000km, but if there is no excessive wear I believe they can swap out the chain guides.